Apple Tree Cottage is situated in a quiet valley of the river Krka in Slovenia. Ideal for families and for active and relaxing holidays. Apple Tree Cottage is situated in a quiet valley of the green river Krka (pronounced Ker-ka) in Slovenia. It offers an enviable degree of seclusion in a private orchard surrounded by fragrant grass fields. 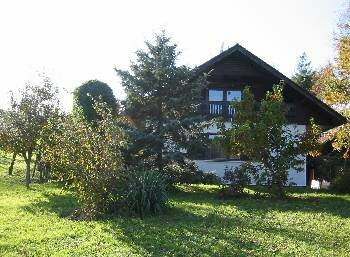 The cottage is located 10-minutes walk from Krska Vas village at the beginning of the river Krka. The views from the cottage reach the edge of the forest behind the surrounding grassland. The oak trees in the courtyard shelter the front terrace on hot summer days. The private orchard with the garden at the back of the house inspires peaceful ambience for warm summer evenings. The property includes an organic vegetable garden with a variety of seasonal vegetables for the benefit of the guests. Two sitting areas in the front of the house and in the garden at the back offer a choice of leisure time and outdoor dining. The local villages offer a number of authentic restaurants and traditional inns. The neighbouring hills lend themselves for unspoiled walking tours, mushroom picking, and mountain biking and cycling trips. Krka, “the green river of Dolenjska” is an admired fishing destination. The rivers streams and waterfalls attract several kayaking and canoeing enthusiasts. Instructor-led kayaking tours are available. Further downstream health spas of Dolenjske and Smarjeske Toplice offer a range health treatments and public swimming pools filled with mineral spring water. This traditional Slovenian cottage has been built as a comfortable family villa, retaining its down-to-earth country charm. The lounge, kitchen and dining room join into one spacious living area with a traditional Slovenian stone-built stove and terracotta fireplace adding to a cosy rural feel. The sliding door join the lounge with the back terrace enclosed within the garden. On the ground floor there is a double bedroom with a king size bed, a bathroom with a bath/shower and a separate W.C. The master bedroom on the first floor is a large room with the sliding door that leads onto a marble terrace overlooking the grass fields and the forest. The third bedroom is a large room with two beds and two wardrobes. On the first floor there is a second bathroom with a shower. Laundry/utility room is located in the basement. A double sofa bed can sleep additional 2 people. Two bicycles available free of charge. Additional bicycles at extra cost.